Representative of families lost, entire villages and towns of people, cities are the front door handles, now being sold en masse. And this is what is left of old China. And this is where it was lost completely. It is unknown to me at least whether the Tibetans borrowed a Chinese design for the door handles or the other way around, both are seen still in use today in both areas and Nepal. Though we can’t say for sure if they are Tibetan or Chinese one can only suspect from recent Chinese/Tibetan history that many of these old houses had a past full of tears, as they may have graced many a good family accused of being “aristocratic”, and having too much by the communist regime, or for being associated with monastic traditions and religion. It is questionable, as to what these faces of animals originally represented. Somewhere in between man and beast and lion there was these fantastic guardians of the gate. Some are very lion like, while some not at all. But it reminds me of Mara (Yama?) and the Wheel of Life often depicted in Tibetan thangkas. Renamed many times in it’s travels, this also may be a form of Rahu– a severed head of a mythological being that swallows the sun and causes eclipses, but long lost is this ancient Indian heritage even to its Tibetan and Chinese owners. 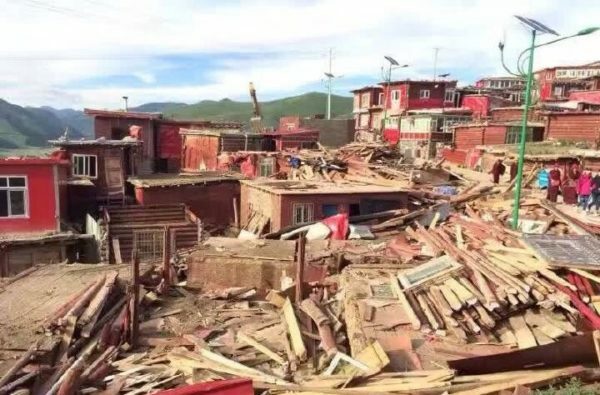 This is where some may have came from- demolitions of Tibetan homes and religious centers like this one at Larung Gar in Serthar, Sichuan in 2016- that were undertaken to reduce the monastic population to half (from 10,000 to 5,000). 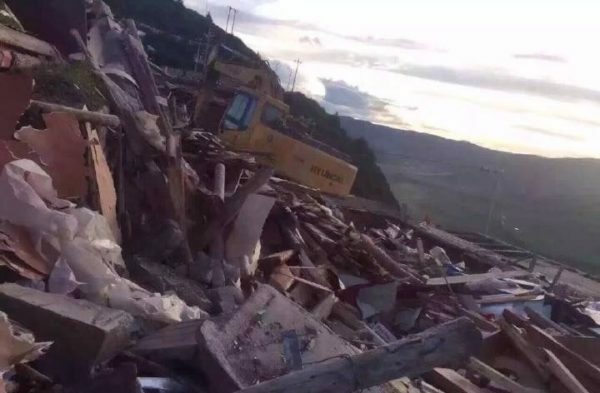 In the photo on the right, building materials are being stacked to be recycled, believed to be the source of where much of the goods on Ebay being sold by Chinese comes from including these door handles. After trying to destroy traditional cultures and homes for over 1/2 a century, it makes for quite a stockpile of front door handles that could be sold, that is still being added to today. These aren’t being sold by just some individuals who were down on their luck but by only a few sellers who are posing as multiple ones &/or working for the same organization- since they all use the exact same photographs and have tens if not hundreds and thousands of the exact same antiques. These sellers also don’t have any rugs or baskets which is very strange given the fact they are supposedly “Chinese antique dealers”. A much bigger version of the face above is featured below. While the door knockers above were to the typical courtyard of a family home, these may have been for a palace or a place of worship, and not owned by an individual or only by the very wealthy elite. Similar to the previous door handle, this model has an additional sword, which is also a commonly reoccurring motif. Part of the problem in China’s communist party in selling all of the people’s things off is that they were their things, but part of the problem is that they are the people’s things. This means that many should be better kept in museums to learn about history and where we all come from, for no value can be placed upon knowledge that is lost- priceless it is. For it is the world’s greatest stockpile of Chinese and Tibetan, Asian and Middle Eastern and all human history, all going up in smoke, lost to to short sighted greed who never really did respect their elders. Obviously. Made from clay, the symbolic door handles above may have once adorned a palace or other important place. They were found in a tomb probably with the amount of dirt on them, another one of those items best left to a museum and with provenance (where they were found and what other artifacts they were associated with). To purposefully to disinherit their own aristocracy and regal history are such things sold as is. This symbol, the lion and ring for a door, isn’t unique to China or Tibet. Reliquary from Gameunsa Temple, South Korea, from the 7th or 8th century featuring two lions with rings.